Albert Jacka VC, MC & Bar (10 January 1893 - 17 January 1932) was an Australian recipient of the Victoria Cross, the highest decoration for gallantry "in the face of the enemy" that can be awarded to members of the British and Commonwealth armed forces. Jacka was the first Australian to be decorated with the VC during the First World War, receiving the medal for his actions during the Gallipoli Campaign. He later served on the Western Front and was twice further decorated for his bravery. Albert Jacka was born on a dairy farm near Winchelsea, Victoria on 10 January 1893, the fourth of seven children to Nathaniel Jacka and his English-born wife Elizabeth (ńee Kettle). His family moved to Wedderburn, Victoria when he was five years old, where he attended the local school before working with his father as a haulage contractor. He was working for the Victorian State Forests Department when the First World War broke out. He fought in the Gallipoli Campaign that started on 25 April 1915, when his new division landed at Anzac Cove on the 26th in the Dardanelles, fighting against Turkish defenders on a narrow beach. The NZ&A-held position, a series of trenches which became known as Courtney’s Post, was where Jacka won the Victoria Cross. On 19 May 1915, the Turks launched an assault against the Anzac Line, capturing a section of the trench at Courtney’s Post; one end of which was guarded by Jacka. For several minutes he fired warning shots into the trench wall until reinforcements arrived, after which he attempted to enter the trench with three others; all but Jacka were either wounded or pinned. It was then decided that while a feint attack was made from the same end, Jacka would attack from the rear. The party then proceeded to engage the Turks with rifle fire, throwing in two bombs as Jacka skirted around to attack from the flank. He climbed out onto "no man's land", entering the trench via the parapet. In the resulting conflict, Jacka shot five and bayoneted two Turkish soldiers, forcing the remainder to flee the trench; he then held the trench alone for the remainder of the night. Jacka’s platoon commander, Lieutenant Crabbe, informed him the following morning that he would be recommended for his bravery. War Office, 24th July, 1915 His Majesty the KING has been graciously pleased to award the Victoria Cross to the undermentioned Officers and Non-commissioned Officers:- No. 465 Lance-Corporal Albert Jacka, 14th Battalion, Australian Imperial Forces. For most conspicuous bravery on the night of the 19th-20th May, 1915 at "Courtney's Post", Gallipoli Peninsula. Lance-Corporal Jacka, while holding a portion of our trench with four other men, was heavily attacked. When all except himself were killed or wounded, the trench was rushed and occupied by seven Turks. Lance-Corporal Jacka at once most gallantly attacked them single-handed, and killed the whole party, five by rifle fire and two with the bayonet. For most conspicuous bravery on the night of the 19th-20th May, 1915 at "Courtney's Post", Gallipoli Peninsula. 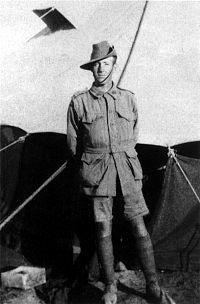 Following his VC action, Jacka instantly became a national hero; he received the �500 and gold watch that the prominent Melbourne business and sporting identity, John Wren, had promised to the first Australian of the war to receive the VC, his image was used on recruiting posters and magazine covers, and he received rapid promotions; first to Corporal on 28 August, to Sergeant two weeks later on 12 September, and to Company Sergeant Major on 14 November. He became Company Sergeant Major of Company C, and saw much fighting at Gallipoli where, during August at the Battle of Chunuk Bair, Hill 971, and Hill 60, his battalion was still trying to break the beachhead. After nine months of fighting and 26,111 Australian casualties, the Allied forces began to evacuate the peninsula in December 1915, where Jacka was reassigned with the 14th Battalion to Egypt. In Egypt, he passed through officer training school with high marks, and on 29 April 1916 was commissioned Second Lieutenant. During this time, the AIF expanded and was reorganised; the 14th Battalion was split and provided experienced soldiers for the 46th Battalion, and the 4th Brigade was combined with the 12th and 13th Brigades to form the 4th Australian Division. The division was sent to France, and the Western Front, in June 1916, where Jacka and his unit was assigned to the Allied trenches near Armentix�res, participating in several raids against the German trenches. Following the heavy casualties on the Somme, the 14th Battalion was transferred to the Pozix�res sector of the Somme offensive. Jacka’s division, on 23 July 1916, was involved in the attack of Pozix�res planned by Major General Harold Bridgwood Walker. The Australian division suffered 5,285 casualties after three days of fighting. The Australian force captured Pozix�res, but the fight was so bloody that the Australians could only identify their trenches by the bodies of their comrades showing their red-and-white shoulder patches. On the morning of 7 August 1916, after a night of heavy shelling, the Germans began to overrun a portion of the line which included Jacka’s dug-out. Jacka had just completed a reconnaissance, and had gone to his dug-out when two Germans appeared at its entrance and rolled a bomb down the doorway, killing two of his men. Emerging from the dug-out, Jacka came upon a large number of Germans rounding up some forty Australians as prisoners. Only seven men from his platoon had recovered from the blast; rallying these few, he charged at the enemy. Heavy hand-to-hand fighting ensued, as the Australian prisoners turned on their captors. Every member of the platoon was wounded, including Jacka who was wounded seven times; including a bullet that passed through his body under his right shoulder, and two head wounds. Fifty Germans were captured and the line was retaken; Jacka was personally credited with killing between twelve and twenty Germans during the engagement. Picture - Jacka with fellow VC recipient, Martin O'Meara, 1916. Both were recuperating from wounds in England. Jacka was awarded the Military Cross for his actions at Pozix�res, although originally recommended for the Distinguished Service Order. Many present at the time, as well as many historians since, have voiced the opinion that Jacka deserved a second Victoria Cross for the Pozix�res action. One of only two bars (second award) to the Victoria Cross awarded during World War I was earnt the following day by Captain Noel Godfrey Chavasse of the Royal Army Medical Corps. Captain Chavasse subsequently died of wounds sustained during this second VC action. The other bar to the VC was earnt by Arthur Martin-Leake during the period 29 October to 8 November 1914 near Zonnebeke, Belgium, when, (the award citation says), Martin-Leake showed most conspicuous bravery and devotion to duty in rescuing, while exposed to constant fire, a large number of the wounded who were lying close to the enemy's trenches. Martin-Leake was the first of only three men to be awarded a bar to his VC. The reason why Jacka was not given a bar to his VC has traditionally been ascribed to British snobbery towards a rough colonial. In fact Jacka was not recommended by his Australian officers in the first place. Gordon Corrigan in Blood Mud and Poppycock has identified why this might be so. The Germans easily infiltrated Jacka's platoon position in broad daylight without being challenged. In all probability the sentries were asleep or absent and Jacka should have ensured that they were not. While Jacka should be commended for his robust action in sorting the problem, he undoubtedly bears a responsibility for allowing it to happen in the first place. Evacuated to England, he was promoted to Lieutenant on 18 August 1916, and falsely reported dead on 8 September. He attended an investiture ceremony at Windsor Castle on 29 September; receiving his Victoria Cross from King George V, before rejoining his unit in November. Promoted to Captain on 15 March 1917, he was appointed the 14th Battalion's intelligence officer. By early 1917, the Germans had retired to the Hindenburg line, and on 8 April Jacka led a night reconnaissance party into "no man's land", near Bullecourt to inspect enemy defences before an allied attack against the new German line. He penetrated the wire at two places, reported back, then went out again to supervise the laying of tapes to guide the infantry; in the process he single-handedly captured a two-man German patrol. He was awarded a bar to his Military Cross for this action. Jacka was given command of D Company, 14th Battalion, and in June led his men through the Battle for Messines Ridge. During their advance, the company overran several machine-gun posts and captured a German field gun; Jacka's actions went unrecognised. On 8 July, he was wounded by a sniper near Ploegsteert Wood, resulting in nearly two months hospitalisation. Returning to the front, he led the 14th Battalion on 26 September in an attack against German pill-boxes during the Battle of Polygon Wood. Jacka was recommended for the Distinguished Service Order a second time for this feat, but again it was not granted. In May 1918, Jacka was finally removed from the conflict when, outside the village of Villers-Bretonneux, he was badly gassed and a missile passed through his trachea. He was evacuated to No. 20 Casualty Clearing Station at Vignacourt, where it was thought that he would not recover. When he did, he was sent to Britain for two operations and a long recuperative period. He returned to Australia on 6 September 1919 and his AIF appointment ended on 10 January 1920, when he returned to Melbourne to a hero’s welcome. 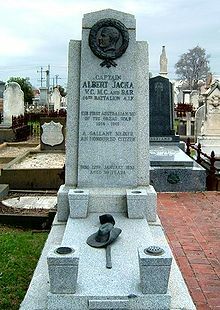 Picture - The grave of Albert Jacka, VC, in St Kilda cemetery, Melbourne. After the war, Jacka, R. O. Roxburgh and E. J. L. Edmonds, both former members of the 14th Battalion, established the electrical goods importing and exporting business Roxburgh, Jacka & Co. Pty Ltd. The business was heavily financed by John Wren, but collapsed with the Great Depression in 1931. On 17 January 1921, at St Mary's Catholic Church, St Kilda, Jacka married Frances Veronica Carey, a typist from his office. The pair settled in St. Kilda, and later adopted a daughter, Betty. In September, 1929, he was elected to the St Kilda Council, becoming mayor the following year. Much of his civic work was characterised by his strong interest in assisting the unemployed. On 14 December 1931, Jacka collapsed after a council meeting and was admitted to Caulfield Military Hospital. On 17 January 1932, one week after his 39th Birthday, he died from chronic nephritis; he was buried at St. Kilda Cemetery, with eight other Victoria Cross recipients acting as pallbearers and an estimated 6,000 witnesses to the burial as his body passed en route to the cemetery. Albert Jacka's Victoria Cross is displayed at the Australian War Memorial in Canberra, and a commemorative service is held every 17 January in St. Kilda to honour Jacka; originally organised by former members of the 14th Battalion, it is now held by the local council. The suburb of Jacka located in Canberra, Australia's National Capital is named in his honour. Picture - Albert Jacka's medals on display, under perspex, whilst on loan to the State Library of South Australia, 8 August 2010.